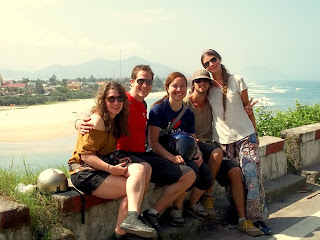 While in Hue, we ran into an Argentinean couple we met in Hanoi. Since we were all heading a bit further south to Hoi An, we agreed to travel together and make it an adventure. Following a morning of negotiating and researching, we rented a guide, Mr. Dung and 2 motor scooters from the Hue Riders. I rode behind Mr. Dung on the big bike, the Argentinians on one scooter, and Dan and Ariel on the other. Our first stop was along the side of the road where Mr. Dung told us about the importance of fishing while taking a smoke break and Dan peed. Our next stop was Elephant Waterfall. 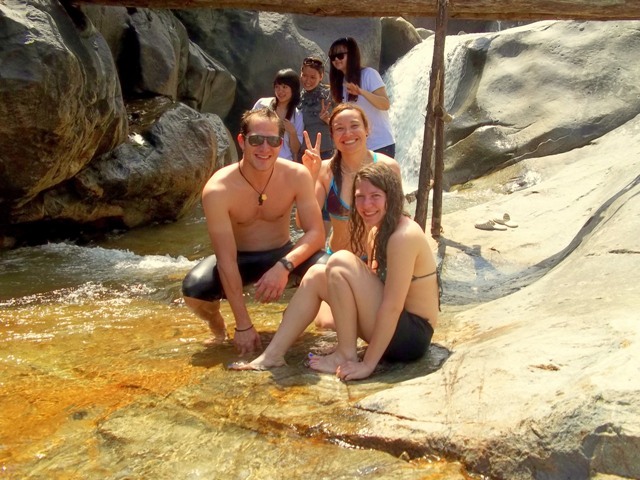 We spent about 10 minutes cooling off in the icy water and another 20 minutes having a photo shoot with each other and the locals. Mr. Dung took a number of photos, but later when we looked through the photos, he only actually took about 3 out of the 15 staged photos. Who is imposing on who's photo? 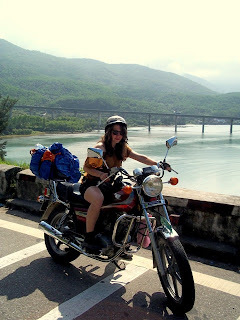 The Hai Van (“Ocean Cloud”) Mountain Pass was by the far the most beautiful and scariest part of our journey. 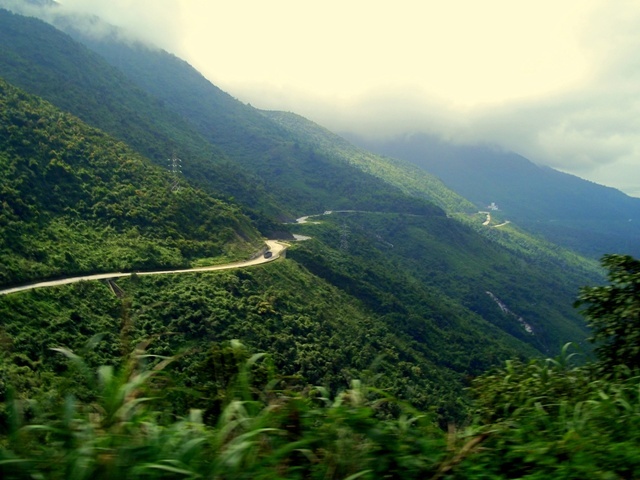 This 2 mile long stretch of highway passes through the Annamite Range that runs parallel to the South China Sea. The views are breathtaking and since the opening of the Hai Van Tunnel, the road is much less congested and much safer. Moms don’t worry; Mr. Dung was a great guide and made sure all of us made it in one piece. Our final stop was Marble Mountain, which is made up of 5 marble and limestone hills named after the five elements; water, metal, wood, earth, and fire. 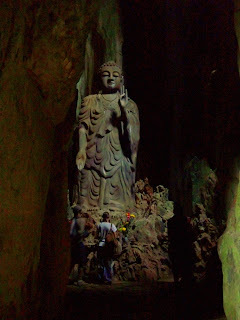 There are a number of natural caves inside the hills which house a variety of small Hindu and Buddhist sanctuaries. Although marble in no longer taken directly from these hills, the area is well-known for its stone sculptures. Expect a giant marble lion on your doorstep in a month or so. 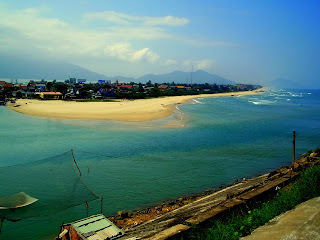 We arrived in Hoi An by sunset, exhausted, sun burnt, and smelly. We said good-bye to the Argentineans and started the dreaded hotel search. After walking the streets up and down, we discovered that most of the hotels were completely full. In the end, we had two options: a $45 room or beds in a dorm at a hostel for $5 a piece. Being the true backpackers that we are, well that and the fear of someone else taking one of the last 3 beds in the hostel, we opted for the dorm. Dan squeezed into a room of about 7 other adults, one of whom was seriously concerned about her missing pajamas and began to interrogate Dan since he was seen sitting on her bed. Ariel and I climbed 4 flights of stairs to a tiny room with 4 beds set in a row. A bit cramped, but not too bad for one night. The next morning we got up early, though not really by choice since everyone else in the hostel seemed to start their day around 6:30am. We took advantage and booked for a hotel promising a swimming pool, breakfast buffet and free happy hour for an hour each night. I was super excited about the swimming pool, but of course by the time we actually had a chance to swim, it rained. The breakfast buffet was a bit sad, but we stuffed ourselves with baguettes and hard boiled eggs. Happy hour was actually an hour of rum with a dash of passion and mango juice until they ran out of juice and then filled our glasses with straight rum. Let’s just say we slept soundly each night.